The quaint old postcard picture from which the illustration shown above was reproduced, was made well over 50 years ago. And as often happens, the way by which the postcard reached this column is almost as interesting as the story of the picture itself. On a recent visit to Wayne, Mrs. Elizabeth Frame Woodlow, a resident of Brookline, presented the old picture to Miss Mary Brooke, of St. Davids avenue. A number of years ago the two were neighbors in Radnor. Miss Brooke’s parents, the late Mr. and Mrs. Horace L. Brooke lived on King of Prussia road, on what is now the Charles M. Tatum place. The Frame family, of which Mrs. Woodlow is a member, lived near the corner of Weadley and King of Prussia roads. “The small stone springhouse was built more than 100 years ago. 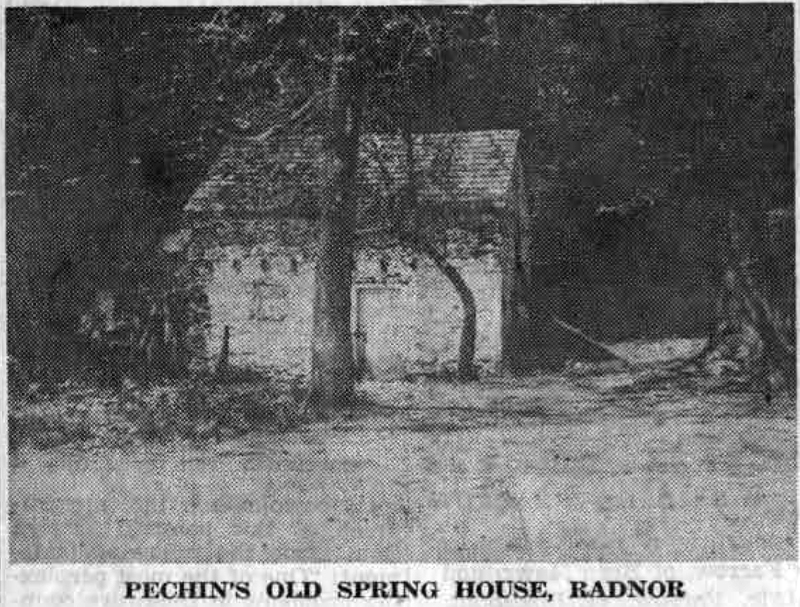 It stood on the site now occupied by the gate house of ‘Villa Cabrini’ on King of Prussia road, north of Eagle road, and was torn down when James W. Paul built the present gatehouse, about 60 years ago. “Few residents of the township will remember it, still less that it was used by the parents of Peter Pechin, Edward and Ann Wagner Pechin, who lived in the homestead on the opposite side of King of Prussia road (now owned by William Gerhard). “Subsequently, the homestead was sold to Mr. Watson and Peter Pechin and his family moved to the farm east of Eagle road, and the springhouse was little used, except by an old Civil War veteran, named Jim Donaldson, who was a sort of handy-man on the Pechin farm. Jim used to sing old Civil War songs, such as ‘Carry me Back to Old Virginny,’ ‘Old Uncle Ned’ to the grandchildren. “Occasionally, Jim would go on a binge – his favorite beverage, when he couldn’t get the real thing, was paregoric, and he slept off the effects in the room over the spring, the entrance to which was at the right end of the building. “About once or twice a year, a band of gypsies camped in the field adjoining the springhouse, at the corner of Eagle and King of Prussia roads. They were English gypsies, the Stanley and Wells families, who owned beautifully decorated wagons and fine horses. Once, when they were camping in Radnor, one of their horses became tangled in barbed wire and was badly cut. They sent one of their men to borrow a Bible from Mr. Pechin. He asked what they wanted with it and he was told that there was a verse in the Old Testament which, when repeated, would stop the flow of blood. He asked them to tell him where to find it, but the reply was that a man couldn’t tell another man, or the charm wouldn’t work, but they would leave a straw in the place where the verse was found and since it referred to blood, he would be able to identify it. Of course, the bleeding of the horse was stopped! A recent column showed pictures taken more than 50 years ago, of property on Aberdeen avenue which has since come into the possession of St. Katharine’s parish. The house on the northwest corner of Windermere and Aberdeen avenues now serves as a convent for the Sisters of the school faculty. The writer has thought it might be interesting to follow this with a brief history of the early days of St. Katharine’s Church itself. An especially interesting account appears in “Rural Pennsylvania,” by the Rev. S.F. Hotchkiss, published in 1897. St. Katharine’s parish was established June 7, 1893, by the Most Rev. Patrick J. Ryan, Archbishop of Philadelphia, who appointed the Rev. Matthew A. Hand, assistant priest of the Church of the Assumption, Philadelphia, to assume spiritual charge of Roman Catholics living in the Wayne area. At the same time, Father Hand was given charge of St. Monica’s, then a mission church in Berwyn. Up to this time, all Catholics of this area were under the jurisdiction of the Augustinian Fathers of Villanova, and attended Mass at the parish church of St. Thomas of Villanova. On the 20th day of June, Mass was celebrated in the Wayne Opera House, and for five Sundays afterward, the congregation continued to attend Mass in this public hall. In the meantime, a temporary chapel of frame was being constructed. This chapel was on the northwest comer of the present site, and was dedicated July 30, 1893. Then a plot of ground, 150’ x 200’ was donated by A.J. Drexel and G.W. Childs, upon the condition that a handsome stone church, costing at least $25,000 should be erected there within a period of three years. To comply with these conditions was no easy task with a congregation which, including men, women and children, did not exceed 300. Satisfactory plans for the new church and rectory having been designed by H.A. Roby, of Lebanon, and a favorable bid having been received for the construction, ground was broken for the new structure on April 16, 1895, and the cornerstone of the church edifice was blessed and laid the following June 9, Archbishop Ryan officiating. The rectory was completed by the end of the year and was formally occupied by the rector on January 2, 1896. The author of “Rural Pennsylvania” adds a brief notice from the “Catholic Standard and Times” written for the August 22, 1896, issue, concerning the Rev. Matthew A. Hand, who was described as “the zealous young rector of the infant parish.” Born in Philadelphia in 1860, Father Hand was ordained to the priesthood on January 11, 1885, by Archbishop Ryan. His first mission was St. Dominic’s Church, Holmesburg. Later be was transferred to St. John’s, going from there to St. Agatha’s and thence to the Assumption, where he served until June 7, 1893, when he was appointed pastor of the new St. Katharine’s parish. Raising $25,000 at the turn of the century was no easy task for a young pastor, whose congregation included very few, if any, wealthy members. However, in addition to the willing family members, the parish numbered a large group of men and women who were employed as domestics, gardeners, chauffeurs on neighboring estates. It has frequently been said that the sacrifice of these members played a conspicuous part in the building of the new church. One of the large sanctuary windows depicting St. Zita was installed in their honor and in appreciation of their efforts. Fearing that sufficient funds could not be raised by parish means, Father Hand undertook the wearying task of obtaining help by weekly visits to other parishes of the Archdiocese, with personal pleas to the members of those congregations. His fund-raising efforts were so successful, that when his successor, the Rev. Joseph F. O’Keefe, was appointed in 1901, the parish was entirely free of debt.